If you love the sun, sea, sand, slots and bingo, then look no further, the perfect game is here. Love Island Slingo is based on one of the most popular dating shows – Love Island. This cross between slots and bingo is teeming with bonus features and big wins. Love Island Slingo has a simple design, with a background of warm beaches and soft waves. This game has over 95% RTP, and you can win a tidy little sum in just one game. However, this is not a game for high rollers as the maximum pay out – the Full House Jackpot – is £5,000. Still, it is a very popular Slingo game and you can access it directly using your Slingo login. You can even try other casino sites that host this game. Layout: The game has the classic Slingo layout – the bingo grid that is 5x5 and the single line of slot reels. You have 11 spins per game and you need to win at least one Slingo to complete the game. When you spin the reels, if there is a number match on the grid, then the box will turn pink and reveal a golden heart. Getting Slingos: o To win the game, you need to get Slingos. You get Slingos by crossing out numbers on the grid until you have completed a row, a column or even a diagonal. o Every time you win a Slingo, you will climb up the Paytable to the left of the bingo grid. Each step will show you what you stand to win. o If you get a Full House where you have cross off every single number on the grid, then you can collect 50 times your original bet. o If you run out of spins and haven’t won a Slingo, or you want to try for the jackpot, then you can buy extra spins with real money. However, you can only buy up to 6 extra spins before the game is finally over. Playing the Game: Before you start the game, you need to set your stake by clicking on the plus or minus buttons on the bottom right corner of the game screen. Click on the START GAME button to begin playing. What makes this simple, yet entertaining game so much fun are its special symbols and bonus features. Wild: The Wild in this game is a colourful beach ball. Wherever it lands on the reels, it will mark off a random number in that column. Super Wild: The Super Wild is truly super wild. When you land this symbol, you can cross of any number – anywhere on the grid! The Shark: This is the bad guy of the game. If a shark appears in the game, it will block any symbol that has landed on the reels in that spin. Instant Cash Prize: If you manage to land 3 or more Wilds or Super Wilds on the reels, then you immediately are awarded a prize. This prize will be a coin that will be added to your current bank roll. 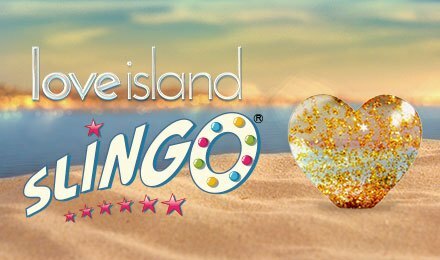 Free Spin: A Love Island Slingo free spin is triggered when you land a Free Spin symbol in the slot reels. You can win up to 6 free spins in a game. These free spins will be used after you have exhausted the spins you started the game with.